Typical redstart which bobs body and shivers tail (like Black Redstart). Male’s black cheeks and throat, contrasting sharply with rusty red underparts, grey crown with pronounced white forehead characteristic; upperparts grey-brown. 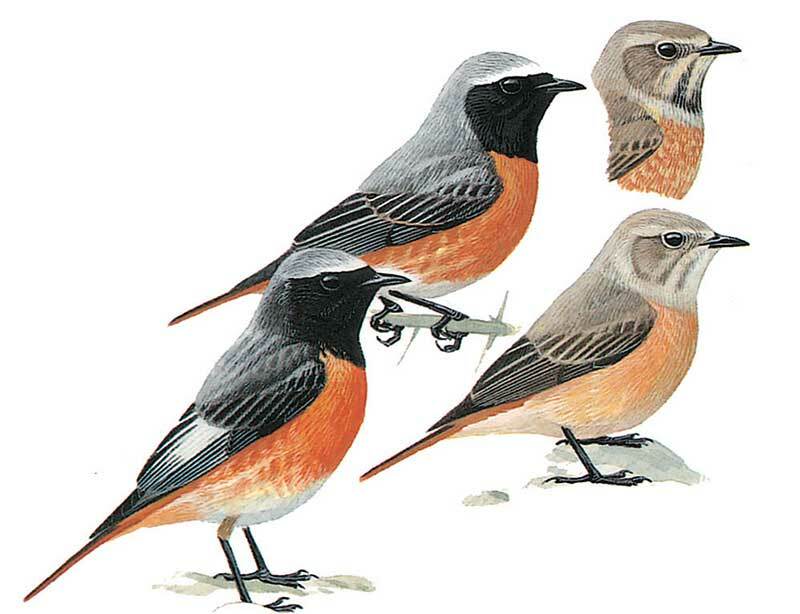 Male samamisicus (breeds Turkey eastwards) has white wing-panel and, often, darker upperparts; (note that all races of male Black are more or less black-breasted); autumn male Common Redstart has black areas fringed pale. Female brownish; separated from similar Black by paler, warmer buffy white underparts. Hunts insects in flycatcher-like fashion. See female Black and Eversmann’s.